Learning how to write cookbook recipes (or recipes for a food blog, or any other media) means being disciplined enough to test the recipes and record the process with precision and consistency, according to the conventions of professional cookbook writers. The proof of writing cookbook recipes well is in the success of the reader's experience with the finished dish. Here are the steps to take to help ensure your written recipes will work for the reader. Do your research into the recipe as you envision it. Even if you're not sure that your first crack at the recipe will work, get your best thoughts in a draft down on paper. This will give you a starting point. List of ingredients – along with measurements and any pre-cooking preparation, such as types of slices. For example, "2 cups baking variety apples — peeled and cut into approximately 1/2-inch cubes" or "1, 28oz can chopped tomatoes. If an ingredient is self-contained, make sure you note the size ("1, 28oz can of whole tomatoes or "1, 16oz. box of powdered sugar"). List the ingredients in the order in which they're used in the recipe. The method of preparation — the step-by-step process of going from ingredients to the finished dish, including oven temperature, types, and sizes of any equipment used (ex. 8" cake pan, 3 qt saucepan), etc. Again, the steps should be in order. Offer options and let the reader know what is "optional" ... For ingredients that are uncommon, seasonal, or expensive (for example, "boneless chicken may be substituted for the wild shrimp" or "you may substitute 1/2 tsp dried basil for the fresh"). Also, if there is alcohol, such as cooking sherry, in the recipe, offer a non-alcoholic liquid substitution. If an ingredient is a nice addition but not essential to the dish (for example, a parsley garnish), be sure to note that it is "optional." While you're doing recipe testing, the recipe document itself will be the repository for any relevant information or insights gained during the testing process. This could be information on adjustments you might want to make when testing the next version, visual cues that might be helpful to the cook, etc. These notes don't all have to be about recipe-writing business. Observations or inspired musings during cooking ("The smell of baking this bread reminds me of the holidays." "These brownies are so easy, why bother with a mix?") are valuable when you write your headnotes, as well. Getting the details of the recipe correct is the easiest right after you've finished testing it. Even the best cooks and bakers can forget a critical detail or have problems interpreting their notes a week after they were written — especially if there have been many recipes tested in the interim. If the test was not entirely successful… Most recipes need more than one test. In that is the case, take specific notes on what and what did not work — "Done too soon? Decrease oven temperature next time." "Not chocolatey enough." Then adjust your draft accordingly and re-test. If the finished dish was perfect; what made it perfect? Again, notes are important. 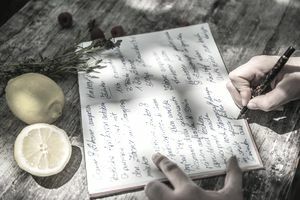 You might want to jot a bit about appearance, texture or anything else that might be useful for your information, to add to the recipe notes, or to the headnotes. Professional cookbook writers test, taste and test again to get the recipe right (and — as one would imagine —organizations like the International Association of Culinary Professionals and the James Beard Foundation consider working recipes extremely important when judging for their cookbook awards). Be consistent. Use the same terminology for the same ingredients. Otherwise, you run the risk of confusion (for example, don't use "butter" and "unsalted butter" if you mean the same thing.) Whatever formatting choices you make, use them consistently throughout your cookbook or blog. For example, if you use abbreviations (like Tbsp. for "tablespoon"), always use the same abbreviations. Write the ingredients and recipe steps in a logical order. That is the order in which the ingredients will be used, and the recipe steps will be performed. Double-check that all the ingredients are used in the recipe method steps.